Given its collegiate vibe, appealing natural setting on the banks of the Willamette River (and just a short drive from the stunning Oregon Coast in one direction and the Cascade Mountains in the other), and longstanding popularity among free-spirited souls, creative creatures, left thinkers, eco-minded outdoors enthusiasts, locavores, and both young and in-the-prime-of-their-years hippies. It's not at all surprising that the state's second-largest city, Eugene, has a highly conspicuous and both socially and politically active gay scene. In fact, this city of about 160,000, which hosts a well-attended Eugene Gay Pride festival each August, is the most popular small city on the West Coast when it comes to LGBT travel. Eugene is just a two-hour drive south of the state's largest city, Portland, and a good southern base for wine-touring in the Pinot Noir-acclaimed Willamette Valley. It's easy to get here by car or train, and the city is even served by a small regional airport with direct flights from Portland as well as several other western cities, including Denver, Los Angeles, Salt Lake City, San Francisco, and Seattle. Considering its size and significant LGBT population, you might expect Eugene to have at least a couple of gay bars, and indeed there have been several nightspots geared to the community over the years. Until very recently, there were no gay bars in town. This probably has something to do with the fact that the nightlife-minded core of Eugene residents are young, many of them students or faculty at the University of Oregon, and they're fairly inclined to drink and dance at mainstream bars and clubs -- in this tolerant city, most establishments are highly gay-welcoming. In this reasonably compact city, you'll find a few different pedestrian-friendly neighborhoods, all within a short drive or bike ride of one another, with a thriving nightlife and dining scenes. These include the small commercial strip around the campus of University of Oregon (along E. 13th Avenue, from the west side of campus at Kincaid Street for several blocks west to around Willamette Street), Downtown Eugene (especially from about 8th Avenue south to 10th Avenue, from Charnelton Street to Pearl Street), the handsome renovated 5th Street Market and nearby blocks, and the more recently gentrified hipster 'hood known as Whiteaker (pronounced like "Whitaker"), which is centered along Blair Boulevard, just northwest of downtown, around West 4th Avenue). Simply stroll around any of these areas, and you're likely to find inviting places to socialize, sip cocktails or coffee, and eat some great (and generally fair-priced) food. Whiteaker has morphed from a little-visited swath of industrial concerns and modest houses into a lively little district of hipster-haunted cafes, bars, galleries, and restaurants. A great time to visit the area is during one of the Last Friday ArtWalks, during which several galleries and shops stay open late and sometimes host receptions. One major drinking destination is the HQ of the increasingly acclaimed Oregon craft brewer Ninkasi (272 Van Buren St., 541-344-2739), which has both a pleasant interior tasting room and a sprawling outdoor seating area that's also served by food carts (the featured cart changes daily). This stellar brewer known for its hop-foward IPAs and a much beloved "Oatis" oatmeal stout also turns out a steady mix of seasonal specialties -- it's one of the best venues for people-watching and socializing in the city. The other culinary "must-do" in Whiteaker is Izakaya Meiji (345 Van Buren St., 541-505-8804), a darkly seductive, late-night food-and-booze purveyor whose tagline reads, "Where East Meets Country & Western." What's that all about? The bar specializes in both Asian and Southern-inspired drinks (from mint juleps with Woodford Reserve bourbon to the shochu-infused Meiji mule. There's also an extensive list of American, Irish, Canadian, and Japanese whiskies, plus a kitchen serving some of the best Japanese bar-eats in Oregon. Consider salted jellyfish with chili oil and shoyu, panfried rice (cya-han) with wild mushrooms and snap peas, chicken thigh skewers, curried udon noodles, and the trademark house Meiji burger with teriyaki coleslaw. Java lovers should duck into Wandering Goat Coffee (268 Madison St.; 541-344-5161) for a cup of high-quality, single-origin espresso - they roast their own fair-trade beans here. Other worthy grounds for food and drink in Whiteaker include the funky, hippie-happy New Day Bakery and World Cafe (449 Blair Blvd., 541-485-1377), whose breakfast burritos are a fine way to start off any Eugene morning; the cool live-music venue Sam Bond's Garage (407 Blair Blvd. ; 541-431-6603), which hosts some damn-good concerts; and the down-home restaurant Papa's Soul Food Kitchen and BBQ (400 Blair Blvd., 541-342-7500), which can be counted on for everything from finger-licking-good barbecue pulled-pork sandwiches and heady crawfish jambalaya to New Orleans-style cocktails to rollicking live bands most Fridays and Saturdays. A long-time downtown favorite with LGBT folks is Cowfish (62 W Broadway, 541-683-6319), a diverse downtown danceteria that occasionally has drag shows and other events favored by the gay community. Another mainstream downtown bar that's earned a strong following in the gay community as well as among pretty much all fans of good coffee (they served Portland's Stumptown brand), tea, creative cocktails, Oregon beers, and well-conceived pub fare is the Barn Light (924 Willamette St., 458-205-8914), an inviting and friendly downtown spot with a convenient central location. Around the retail and dining complex known as 5th Street Market, several excellent options for hobnobbing exist, including the romantic and rather upscale modern French bistro Marché (296 E. 5th Ave., 541-342-3612), which features seasonable local ingredients, a terrific list of both old-world and Oregon and Washington wines, and a cozy, sophisticated decor that's both elegant and understated. By the way, if you're looking for a fun excuse the spend the night (or a full weekend) in Eugene, do consider the stylish and contemporary Inn at the 5th (205 E.
6th Ave., 541-743-4099), a decidedly swanky yet unpretentious boutique hotel with 70 rooms. It's across the courtyard from Marché and the market's other great dining options, and there's a spa attached as well. Options around the University of Oregon are geared more to students and locals -- it's a laid-back scene around here. Cozy old New Max's Tavern (550 E. 13th Ave., 541-349-8986) is a dive-y collegiate legend -- nothing terribly exciting, but convivial and handy if you're wanting a watering hole near the U of O. A longtime favorite for breakfast, lunch, and dinner among everyone from students to artists to hippies, the Glenwood (1340 Alder St., 541-687-0355; also in South Eugene at 2588 Willamette St., 541-687-8201) serves is open only to 9 so doesn't quite qualify as a late-night hangout, but it is a great option for a healthy and reasonably priced dinner (lots of veggie options), and beer and wine are served. If you're looking for a student-minded coffee option, duck into the excellent cafe branch of the aforementioned Marché located inside the Jordan Schnitzer Museum of Art on U or O campus (1470 Johnson La., 541-346-6440). 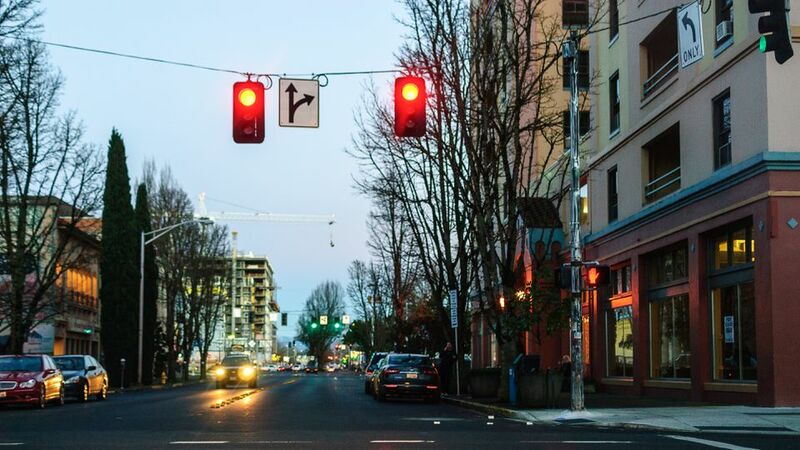 There may not be a lot out there on gay-specific nightlife in Eugene, but you will find plenty of general LGBTQ information on the city as well as other tips on visiting this progressive community. Try having a look at the Queer Eugene website, which has tons of links to and news about upcoming events, and also check out the University of Oregon LGBT resource site, the site of the excellent alternative newspaper Eugene Weekly, and Portland's queer publication, PQ Monthly. Additionally, the region's visit organization, Eugene, Cascades & Coast Tourism, produces a comprehensive travel site on the area with its own dedicated page welcoming LGBT visitors.